Hans Vischer called this trade route "death road" because _____. Ghana grew powerful because it _____. Sunni Ali was the leader of the _____. In A.D. 300, the religion that King Ezana of Axum brought to Africa was _____. What changed the nature of slavery in Africa? What is the earliest African art form known? 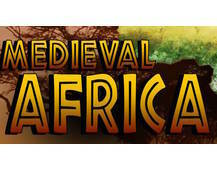 Which kingdom developed in Southeast Africa? Which kingdom did NOT trade in salt? Axum was the empire that _____. What was the capital of the earliest empire?